Packet Sniffer SDK for Windows 4.0 is components & libraries software developed by microOLAP Technologies LTD.
Packet Sniffer SDK (PSSDK) is the most powerful component suite for network packet capture in Windows OS family environment. All Packet Sniffer SDK editions (DLL,VCL, and static libraries for VC and Borland compilers) don't require any pre-installed packet drivers, support multi-Gigabit networks, work with multiprocessor (SMP) systems, and have BPF (BSD packet filtering) engine on the internal driver level. This development software is shareware, which means you can download and use Packet Sniffer SDK for Windows 4.0 for free during the trial period (usually for 30 days). At the expiration of the period you will have to buy the components & libraries product for $999.95. Packet Sniffer SDK for Windows 4.0 is available at regnow and microOLAP Technologies LTD website. Packet Sniffer SDK for Windows 4.0 supports different languages (including English, Russian). It works with Windows 98/XP/Vista. We have tested Packet Sniffer SDK for Windows 4.0 for spyware and adware modules. The software is absolutely safe to install. Our website has thoroughly tested development product Packet Sniffer SDK for Windows 4.0, written the review and uploaded installation file (5853K) to our fast server. 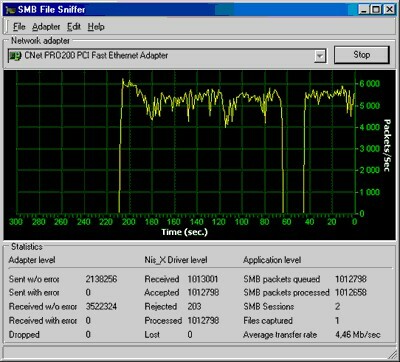 Downloading Packet Sniffer SDK for Windows 4.0 will take minute if you use fast ADSL connection.